I thought I'd continue the creative fabric theme with a feature on Duckcloth, a Melbourne-based online store full of fresh fabrics for print & pattern lovers! The cute name is from the Dutch "doek", (linen canvas) and refers to heavy cotton fabric. Duckcloth's founder, Lisa Edwards, offers cotton fabric by the metre in all sorts of gorgeous prints and patterns. These cottons are ideal for heaps of craft projects - whether you're making toys or table runners, cushions or clothing, bags or board shorts. I've chosen a selection of fabrics by Australian designers to feature here... all currently in stock at Duckcloth, of course! The beautiful work of Melbourne designer Lara Cameron is pictured above with her limited edition "Gingko" prints in Olive Green (left) and Robins Egg (right) on natural linen. This is a medium weight fabric which is AUD $40/m from Duckcloth. I love the colours in both of these prints - though I'm not sure I could choose between them! Kristen Doran is a Sydney-based textile designer whose gorgeous fabrics are hand printed right here in Sydney. Pictured above left is the limited edition "Mollybirds in Chocolate & Aqua on Stone". This is a light to midweight cotton fabric which sells for AUD $26/m. On the right is "Lily Pads in Red on White", another limited edition print, this time on a lightweight cotton for AUD $33/m from Duckcloth. Another Kristen Doran design in stock at Duckcloth is "Owls" (above) which is available in two colourways - Chocolate on White or Red on White. Both are printed on lightweight cotton fabric and are AUD $33/m. Our curious readers will probably also want to check out Kristen's blog, Cheeky Beaks - "It's all about the craft and a tiny bit about life..."
These are friendly faces! Shannon Lamden's quirky designs are hand screen printed in Melbourne. "Cranes" (available in black or cherry red) is AUD $33/m and "Cookies" is AUD $38/m from Duckcloth. I fell in love with Sprout Design after I received an orange giraffe card for my birthday & subsequently discovered their range of screen printed textiles! The label is a relatively new venture for Adelaide's One Small Room, a styling consultancy/retailer with a unique concept. The show room is in fact an installation where continually changing themes unfold for clients interested in 20th century style, retro groove & vintage flair. Sprout Design fabric is available off the roll in store, as well as in the form of soft furnishings - gorgeous bedlinen, cushions, lampshades and more.. The label brings together a collection of works by clever, creative women who design something a little different for the little (and not-so-little) people in your life. Their designs are hand screen printed onto 200gsm cotton fabric here in Australia. The bright & bold animal prints pictured are "Caterpillars Grass Green" (above left, AUD $55/m), "Elephants Ink and Green" (above right, AUD $60/m), "Tortoises Red" (below left, AUD $55/m) and finally, "Hippos Ink and Light Blue" (below right, AUD $60) and are all available from www.duckcloth.com.au. In a fun twist to this story, Sprout Design is currently working on a collaboration with a handful of Australian textile designers - including Lara Cameron whose work is pictured at the top of this post! The new fabrics are yet to be released, but Lara recently posted images of her design contributions on her blog, Kirin Notebook. 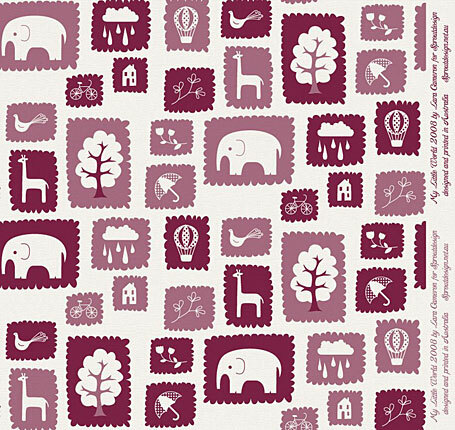 The gorgeous print, "My Little World in Plum for Sproutdesign", is pictured below.